(Nanowerk Spotlight) Ultra- or supercapacitors are emerging as a key enabling storage technology for use in fuel-efficient transport as well as in renewable energy (read more: "Nanotechnologies to mitigate global warming"). These devices combine the advantages of conventional capacitors – they can rapidly deliver high current densities on demand – and batteries – they can store a large amount of electrical energy. Today's commercial supercapacitors – which are mostly electric double layer capacitors (EDLC) – store energy in two closely spaced layers with opposing charges and offer fast charge/discharge rates and the ability to sustain millions of cycles. Researchers have come up with various electrode materials to improve the performance of supercapacitors, focussing mostly on porous carbon due to its high surface areas, tunable structures, good conductivities, and low cost. In recent years, this has increasingly included research on various carbon nanomaterials such as carbon nanotubes, carbon nano-onions, or graphene. "An ideal supercapacitor is one with both high energy density and high power density," Zhi Li, a post doc researcher in David Mitlin's group at the University of Alberta, explains to Nanowerk. "With a given potential window, the energy density is decided by specific capacitance while the power density is governed by the series resistance which is mainly caused by the resistance of electrode materials. Electrode materials with high conductivities are desired in the consideration of power density. However, the complicated microporous structures and disordered texture of activated carbon limits the efficiency of electron transfer and leads to a poor performance of the supercapacitor at high sweep rate." 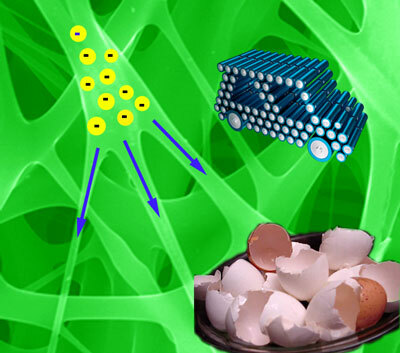 In new work recently published in Advanced Energy Materials ("Carbonized Chicken Eggshell Membranes with 3D Architectures as High-Performance Electrode Materials for Supercapacitors"), first-authored by Li, researchers have demonstrated that a common daily waste – the eggshell membrane – can be converted into a high-performance carbon material for supercapacitors. "Considering over 1000 billion eggs are consumed per year globally, and that 30–40 mg finished carbon is derivable from one egg, the eggshell membrane is indeed a reliable and sustainable resource for clean energy storage," says Li. It has been known that nitrogen-rich carbons perform well as electrode materials for supercapacitors. The team's new finding shows N-rich carbons with suitable architecture work even better. "The most exciting finding, for me, is that the amazing nature-made architecture of chicken eggshell membrane is critical to its performance as electrode materials after carbonization," notes Li. "Why? The carbonized eggshell membrane is a real 'integrated system' composed of interwoven carbon fibers with diameter from 50 nm to 2 µm where the big fibers and tiny fibers are naturally connected together." He recounts that, when he was first looking at the eggshell membrane's microstructure, an image of a power grid system immediately came to his mind: "If you imagine the thick fibers as the long distance, heavy-duty power cables between cities and the tiny fibers as the power cord to light a bulb in your house, you could also jump to an assumption that the carbonized eggshell membrane is a highly effective electron transfer system. Actually, it is. The electrical resistance of carbonized eggshell membrane is 20 times lower than disordered activated carbons without the architecture. Also, the porous system of eggshell membrane has proven to be a system allowing fast electrolytes transfer. Both of those are critical to the fast charging-discharging of electrode materials." Previously, nanotechnology researchers already used eggshell membranes' unique porous structure as template to synthesize nanoscale materials ("Eggshell Membrane Templating of Hierarchically Ordered Macroporous Networks Composed of TiO2 Tubes"). In this new work, the researchers in Canada carbonized eggshell membranes (CESM) to obtain a three-dimensional macroporous carbon film composed of interwoven connected carbon fibers. With its unique architecture, carbonized eggshell membrane can work at high current loading. That means capacitors based on it can be charged and discharged faster than capacitor based on traditional carbons. "We found that, due to its unique structure, the systematic conductivity of CESM is one order of magnitude higher than that of activated carbon, which makes it an ideal electrode material for high power density supercapacitors," says Li. He points out that, with the rapid progress of nanotechnologies, more and more fancy materials are being developed with novel properties and through innovative new techniques. "Using carbon materials as an example, carbon nanotubes and graphene have much higher intrinsic conductivities than the carbonized eggshell membrane that we fabricated, and they have great potential as electrode materials," says Li. "However, the biggest challenge is how to integrate these materials into an efficient system which carries the advantages of each materials and eliminating their respective disadvantages. I believe that this is one of the areas where we can learn a lot from nature.